Great work PSJ, that 1/4” wall thickness is impressive as it eliminates the need for bracing. I’ve found when soloing with the outboard, moving from the rear to the front seat increases speed by up to 1/2 knot. I fitted two telescopic sections of a broken golf ball retriever I had lying around to a cut down outboard tiller extension. Makes a lightweight, easy to fit/remove telescopic throttle control that I can use from the front seat. Couldn't tell from the pictures but do you have some type of a tether on that extension in case it would happen to fall overboard? No, I haven’t felt it necessary to tether John. 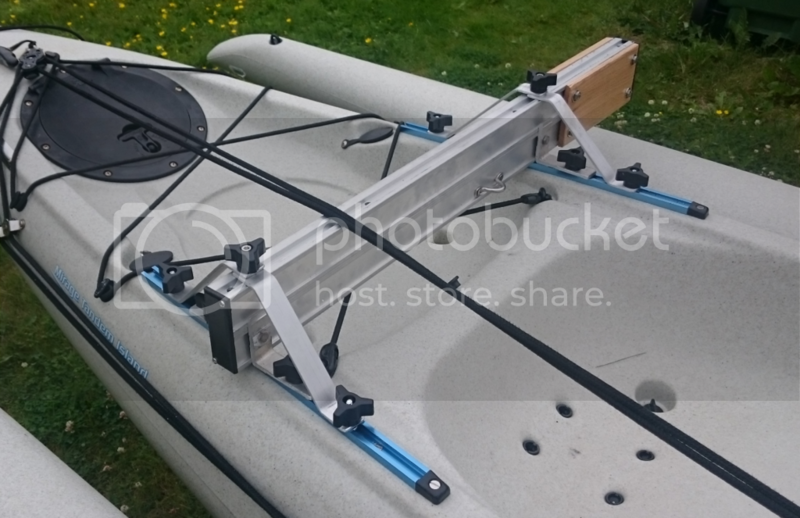 When in use it is securely clamped to the outboard tiller and when not in use it lays across the tramp and is bungeed to the aka. I finally have my mount built. Stuck out in the bay with wind dropped and a LOT of peddling and paddling got me motivated. Based largely on designs seen on this post, I just could not come up with a better design (at least with materials on hand). 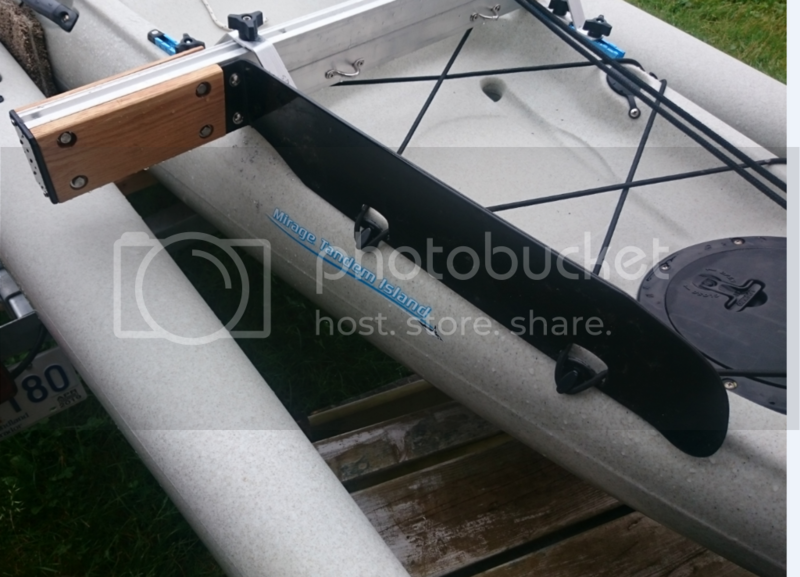 Can't be seen in photo, but the outboard mounting plates actually have a eight degree transom angle. Seems to work well and seems solid. Only issue is that I need to make a plastic splash guard, because if I go more than 1/2 throttle, water pours into the luggage pan. Other than that, the boat moves just fine even at low throttle (2.5hp yamaha). Found that it was easier to totally remove the 2 aft hatch covers for that extra bit of reach getting the backer plate and nuts installed. Looks good and solid YYk and professionally finished! I like what you have done with the bracing. I found (see slomo clip back on page 12 of this thread) that any mount that sits level with the gunwale gets hit by waves when conditions get up, especially when heeled over under sail. If you get the same problem, it would be easy to add a small section of the same tube as a spacer to lift that mount up above the gunwale. Nice work ! I like the way you did the bracing over the top also. Is that aluminum extrusion something re-purposed or off the shelf material ? Really nice setup, I really like the rails, looks like you could attach near anything/everything you can imagine up to them easily. Stringy: all my tiller extensions, at the front I laid in top of my rear aka cross bar, (one on each side of me), I then just made a bungy loop to hold the extension down to the crossbar, really worked well, and never removed from the boat, I ran my kill switch wires up thru the middle of the extension tubes. Hopefully this link will work, Here’s mine. mcoop571 on YouTube. The track is just 3/4 t-track from amazon. Just bent a piece of HDPE, mounted with 2 1/4" ss screws, and a couple of holes routed in so the existing luggage bungees hold it in place. The tail end is also angle outward to help direct water away. I had since found a heavy duty marine track in the city. If I like the setup, I may replace it with the marine stuff and re-purpose the existing. To mitigate the splashing, I just built a splash guard in pics below. Hopefully it works. Might have to follow Stringy's advice and block the mount too (I bet he is right). Thinking I might have to put more angle on the mount also. Hopefully out for a test tomorrow. Was out sailing yesterday and today. Motored yesterday, and found the splash guard did a pretty good job of keeping water out, even in very rough water. Also sailing in good wind today (got 10 knots out of boat), and with wind coming on my starboard - beam reach, the transom does not drag in water so I am happy with that. Only mod I want to do is give the transom a bit more angle. Have been sizing your mount up too. I see you have the mount up a bit higher than mine like Stringy recommended. I was figuring if I keep the prop deeper in the water, there may be less splashing, but haven't experimented to see if that 'holds water', so to speak. My mount is much farther ahead than yours as I didn't want to loose that luggage space. However that meant I had to imitate Stretch Armstrong to get the backing plate and nuts in there (younger readers might not know the toy Stretch Armstrong lol). My back is not as young as it used to be, or even should be, so having the motor closer to the rear seat makes it easy for me to turn around and start it plus I have the throttle in a comfortable position. My biggest disappointment is the discontinued manufacturing to the 2 stroke. That 2.5 Yamaha is as big as a 4hp 2 stroke, and it is still polluting (not sure its any better that a 2 stroke), and does not seem much quieter. Hello Mr. Yakallday. My first attempt at a motor mount was in the same position as yours,(I was so happy that it worked). I have finally settled on my present position by my third rebuild. As I remember it, I wasn’t happy with the noise or splashing with the motor being that close to me, and the first mount was kinda flimsy. Also, it is great fun to make a throttle extension and pilot the boat from the front seat. With the motor on the starboard side, you can steer the boat with your left hand and control the speed with your right. 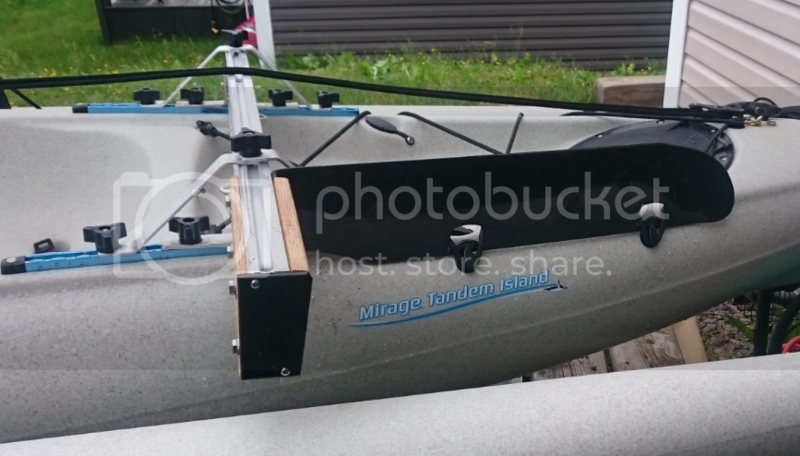 I’m pretty sure there is less “splashing” and much more forward efficiency with the motor up off the gunwale as high as possible, (somewhere close to 8.5”), and here’s something else for you to have a look at, mount your motor and go stand about ten feet straight behind your kayak. Try to envision the motor force, as it relates to the water flow coming around your hull. Now, in your mind, move the motor way back to where Stringy and I have ours mounted (possible ah-ha moment). Hopefully, you will notice that the “force” generated by the prop can be moved much closer to the centerline of the boat, which just has to be a more efficient position. So just to throw out some numbers here, from a birds eye position, your prop now is probably about 18” from the centerline of the boat. If you moved it as far aft as practical, you could cut that down to about 12”. If you want to “quiet” the thing down you will just have to add some beef somewhere (unfortunately). Having said all that, your mount looks Very Good and will likely work fine for you for years to come. Thanks for the comment. Thought about moving it back when I was building it. But, I tend to not use it at all except for a few port entry cases (tide moving in a narrow entrance). Where its located now means I can start it without twisting too much. I just putter along, just over 1/4 throttle is fine. Used it today coming into port against tide and waves, still never went much more than 1/4 throttle. It just slides through the water. Yep, those little 4 stroke outboards are pretty dependable.